Sister Roberta celebrates her Jubilee filled with great gratitude to God and all who have walked with her: loving parents, six siblings, family, Sisters of the Holy Names, and all whom she has had the privilege of journeying with in friendship and ministry. Having grown up with a family of seven children in a small Idaho town, Priest River, with a large population of Italians, Roberta’s “La Familia” roots sunk deep. Community defined her early years and influenced her life choices. Roberta followed her two older sisters to Fort Wright College of the Holy Names in Spokane, Washington. It was there that she met the Holy Names Sisters. 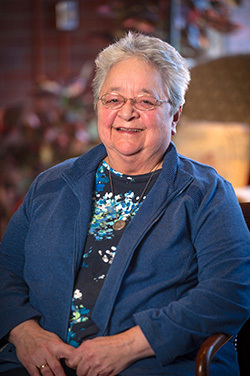 She so admired their faith, their skills, and their love of the students that Roberta felt called to enter the Novitiate at Marylhurst, Oregon. Leaving “La Familia” was difficult, compelling a group of novitiate friends to once lock the book room door, share Christmas goodies sent by their families and tell stories of Christmases at home…sources of joy and community. Genes for loving education no doubt came from Mike, her dad. Priest River Lamanna High School bears his name. Roberta developed her teaching gifts in first grade (Spokane, Richland). When she asked to move up a little (for example, 2nd grade), she was moved to Junior High (Richland, Seattle Inner City). She also spent one year at Holy Names Academy, Seattle. Roberta then joyfully moved to the love of her life: teaching adults, which expanded from parish work (Puyallup, Coeur d’Alene), to adult leadership training in the Seattle Archdiocesan Renew program, to ministry at International Renew (New Jersey). Taking this training on the road, to Cameroon, the Philippines, Guam, England and many dioceses in the United States was a rich experience of the global Church. Roberta’s mom Ann, not only taught her how to make homemade ravioli, but also modeled how to age beautifully, even amidst severe physical pain and an inability to walk. This elder model influenced the development of Wisdomworks, co-created by Roberta, a ministry serving elders, women, and organizations. Roberta rejoices in God’s call to religious life and its unfolding mysteries.